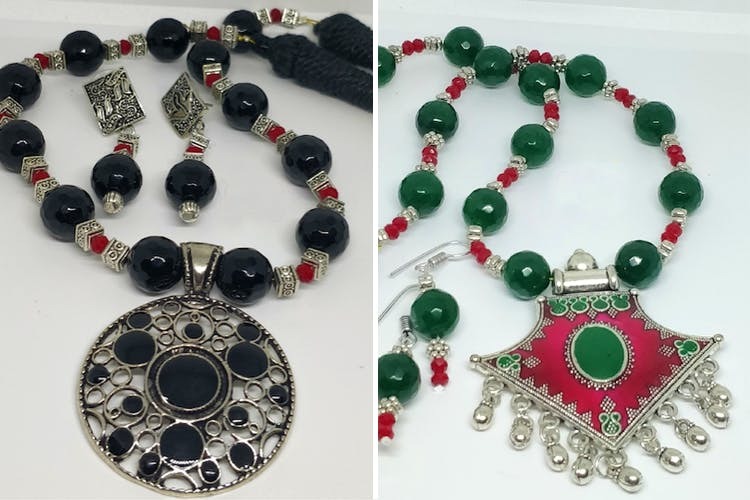 This Mom-Daughter Duo Sells Homemade Jewellery And You Can Buy Merch Starting INR 50! Anusha and her mum have been making and selling wooden necklaces and earrings for a decade for affordable prices. Looking for aesthetic beauty, style, and uniqueness? Try shopping from Tvesha. More than a ‘business’, this brand is about family and doing something they love. Tvesha started when Anusha Venkatesh and her mum Saroja started making jewellery as a hobby for a family wedding. Ten years have gone by, and people are still digging their products! The duo operates out of their home in Mandaveli and makes wooden and crochet earrings, pendants, and use acrylic and glass beads with metal findings in between and cost INR 50. Their hand-painted jhumkas are their best seller and are priced at INR 250. They also make Kundan Rangolis, acrylic sheets with different patterns, for home decor. The selection of beads and the combination in which they use them distinguish their brand from others. Tired of buying expensive ear rings at the mall? Do you and your friends end up with the same jewellery from the same place? With Tvesha’s limited collection, spend less, buy more, and be unique! You can place your order through their Facebook page or at 9840613851.